Fueled by an insatiable bloodlust for vengeance, Darth Maul, the nefarious apprentice of the vile Darth Sidious, vigorously carries out his sinister master’s bidding and relentlessly hunts down the Jedi Knights through the scorching sand dunes of Tatooine. 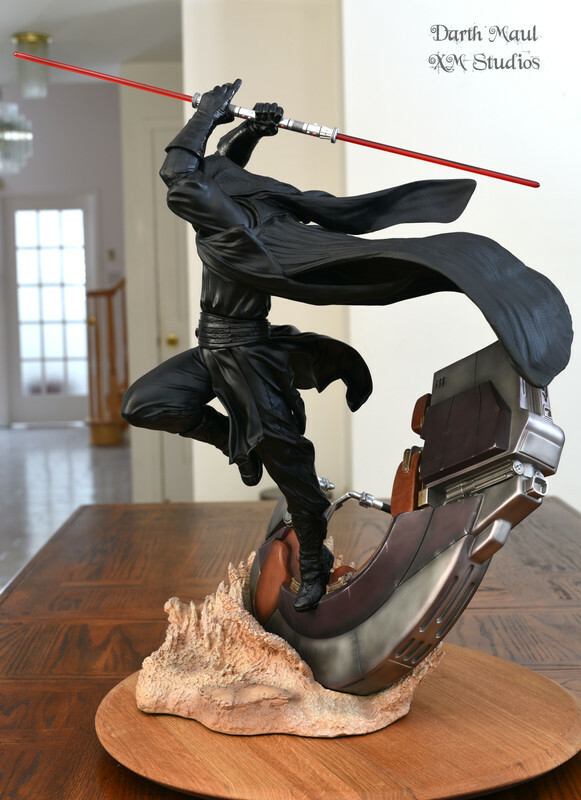 Upon finally discovering his prey, the scowling Sith Lord unflinchingly catapults off his speeder bike wielding his deadly double-bladed lightsaber, primed and ready to exact his vengeance upon his despised Jedi adversaries without mercy. This exhilarating story comes to life in this extraordinary ¼ scale statue sculpted by the exceptionally gifted David Giraud. Whispered legends among the Rebel Alliance reveal that Darth Maul was born on the planet Dathomir, a remote world located in the Quelli sector of the Outer Rim territories. He is believed to be the son of a powerful Dathomar Witch named Mother Talzin, leader of the Nightsisters, skilled wielder of dark force energies, and practitioner of dark magic. 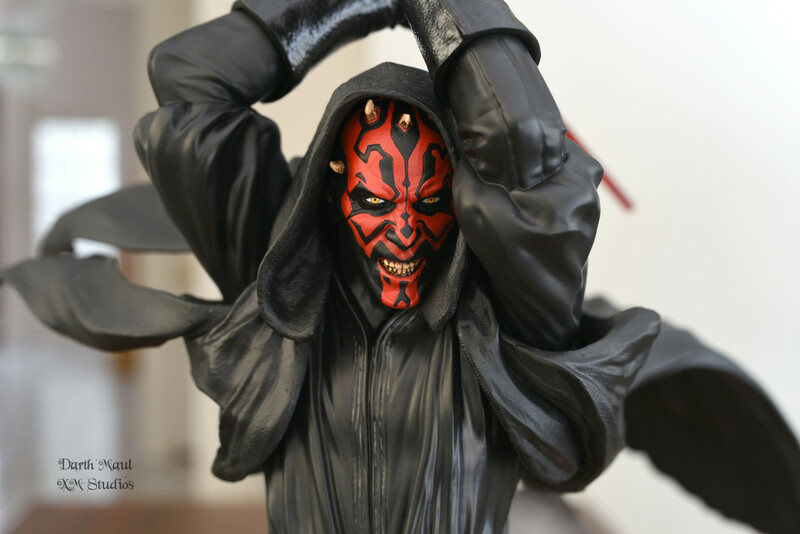 Upon learning that Maul, a force-sensitive child, was destined to become part of a powerful mystic order that would one day rule the galaxy, Darth Sidious abducted him and raised him to serve as his elite assassin and Sith apprentice – in secret. Until now. 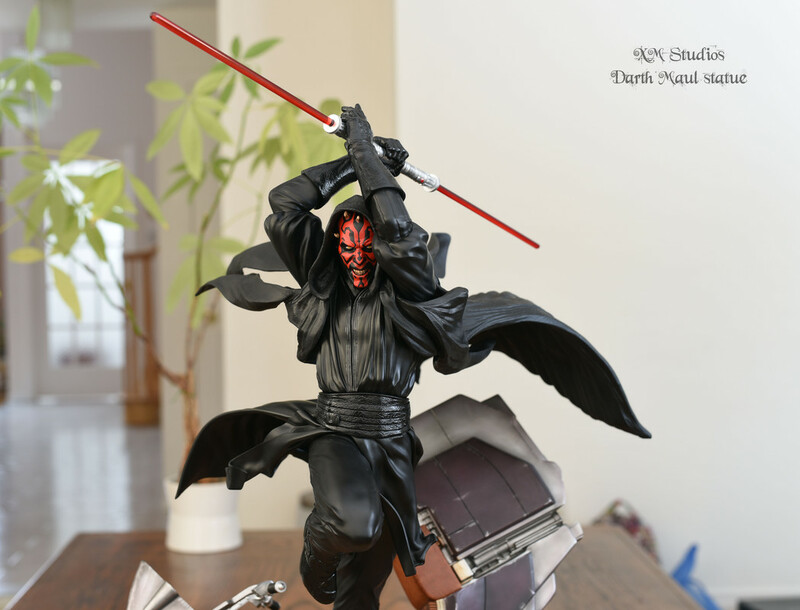 XM Studios proudly presents the fanbase with a remarkable interpretation of the malevolent Dark Lord of Sith, Darth Maul. At last, he is to be revealed. The extraordinary creative team behind the Darth Maul statue are David Giraud (sculpt) and the XM Studios/Hive Design & Development teams. 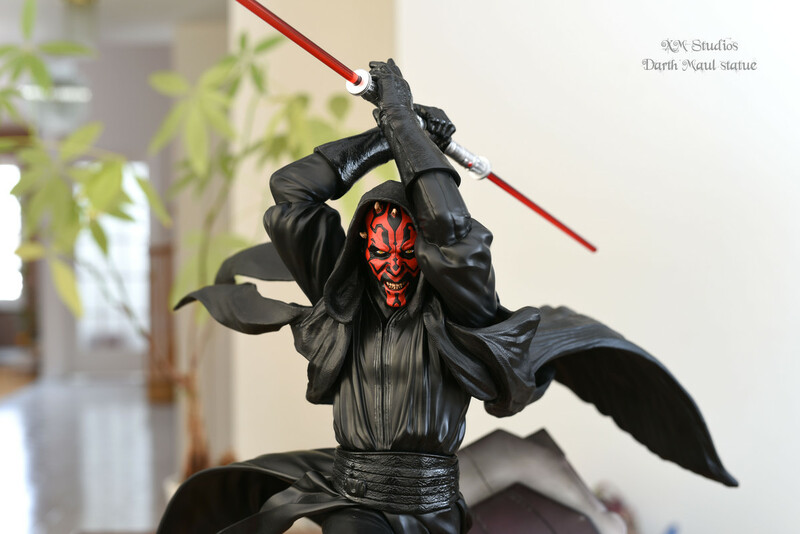 The Darth Maul statue is a towering 28 inches high, 23 inches wide, and 21 inches deep. The statue weighs approximately 30 pounds. It was limited to only 270 pieces worldwide at a retail price of $1099 SGD (approximately $815 US). 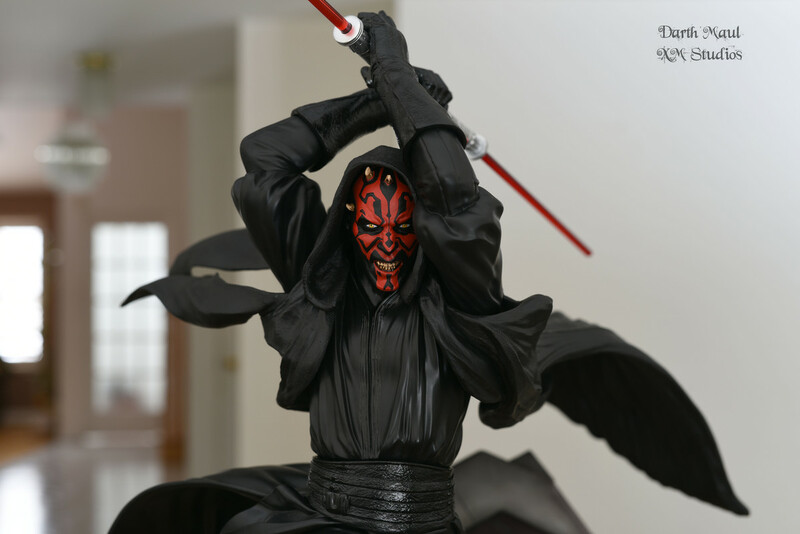 The Darth Maul statue comes in 14 pieces: 1 upper body, 1 lower body, 1 portrait, 2 handle bars, 2 arm pieces, 1 Bloodfin (i.e., the speeder bike), 3 Sith robe extensions, 2 lightsaber pieces, and 1 sand dune base. 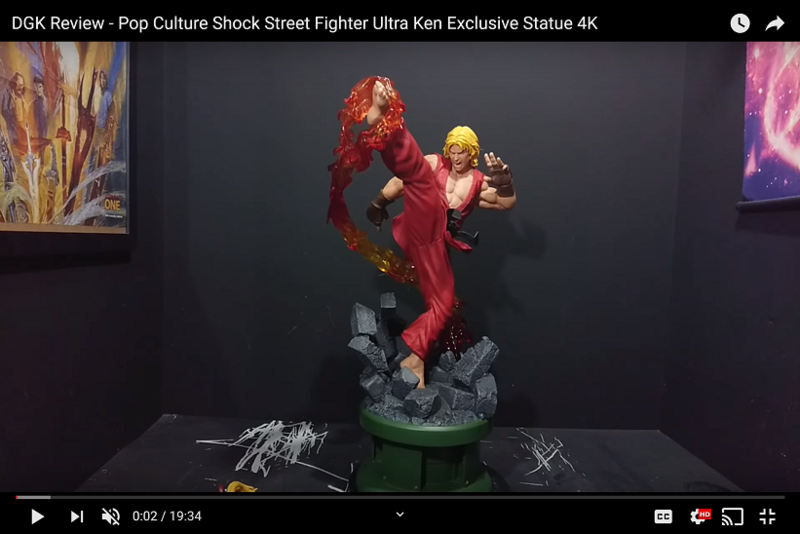 XM Studios began shipping out first batches of this release to Asian markets in January 2019. Sculpture: This is an incredible sculpture. 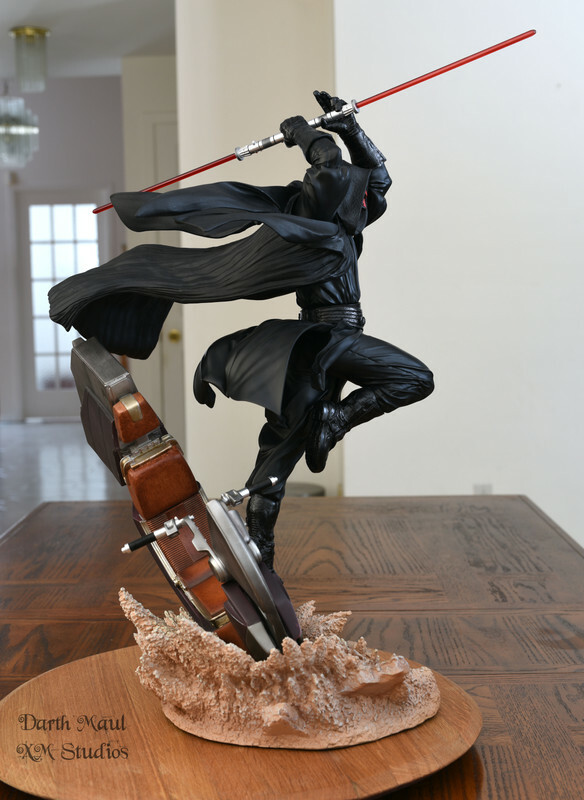 David Giraud, the sculptor, brazenly channels into Darth Maul’s unbridled savagery and ferocity. He brilliantly captures that blood-curling moment just prior to Darth Maul’s vicious assault on the unsuspecting Jedi Knights on Tatooine. Dressed in a pitch-black Sith robe with Samurai-like pleats, Darth Maul braves the sweltering heat of the desert planet and brutally attacks Qui Gon Jinn without hesitation or fear. The unsuspecting Jedi Master looks on with horror and trepidation, perhaps for the first time, in his soon to be short-lived life at the hands of the malicious Dark Lord of Sith. 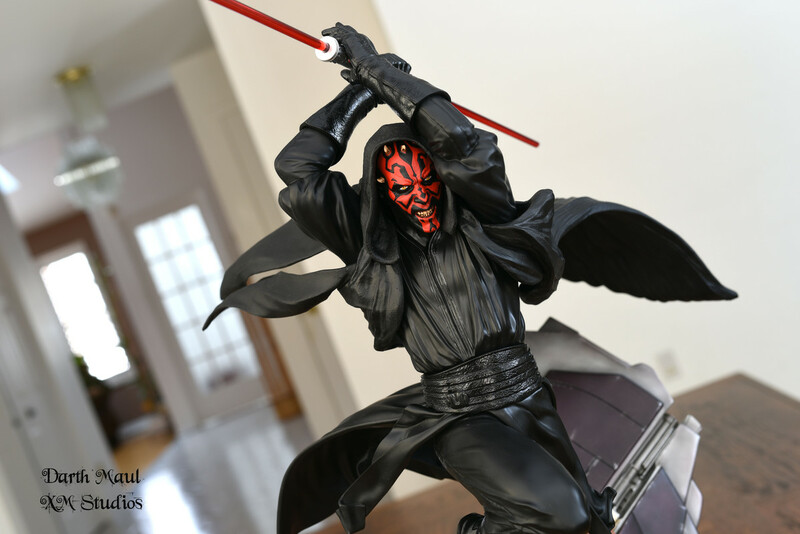 Darth Maul’s double-edged blade features an exceptionally long reach, making him appear as formidable as he does terrifying. 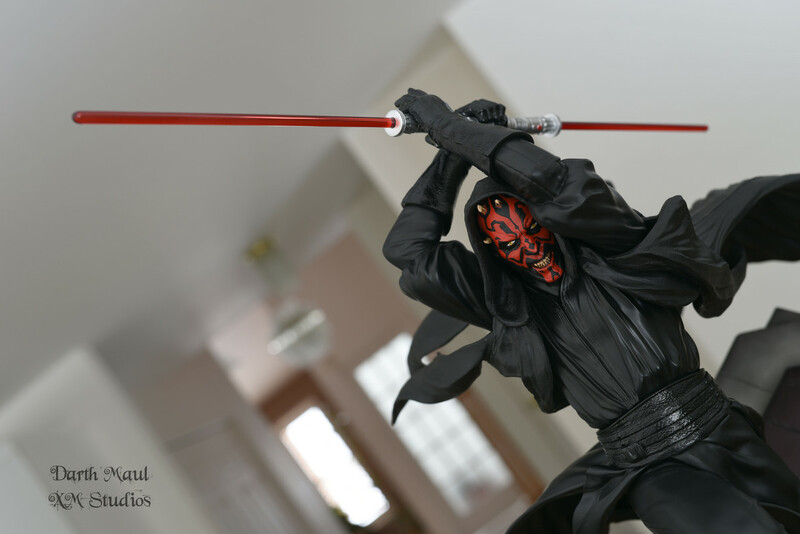 Positioned above his head in a cascading-like manner, Darth Maul’s homicidal intentions are abundantly clear. No one is to make it out alive. Giraud’s painstaking attention to detail on the Sith robe is very impressive. As this statue re-enacts a dizzyingly fast-paced moment in time, virtually every other piece in this dynamic design has to move at the exact same pace or else it wouldn’t ring true. Giraud somehow managed to capture the breakneck speed of the moment exceptionally well. It’s essentially what gives this fluid piece its purpose and defines its objective. 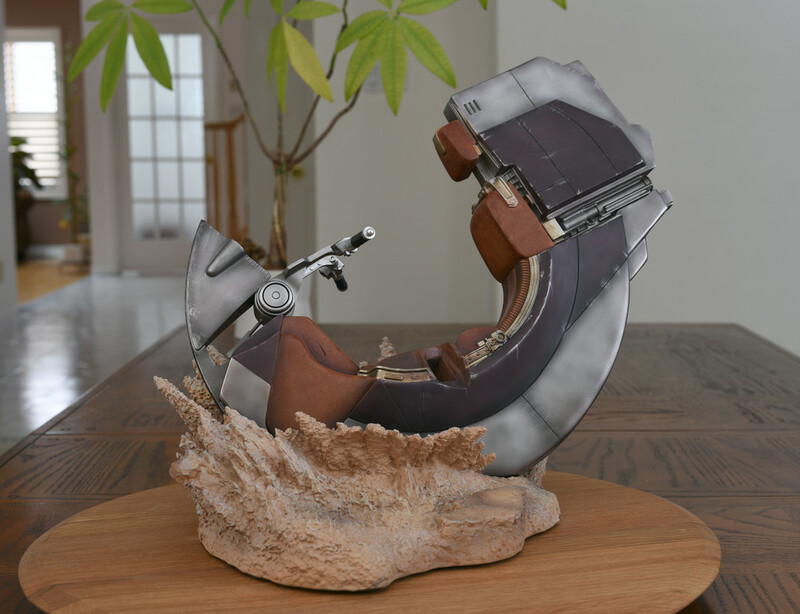 Darth Maul's speeder bike, the Bloodfin, was sculpted by Giraud's sculpting assistant, Greg Rassam. 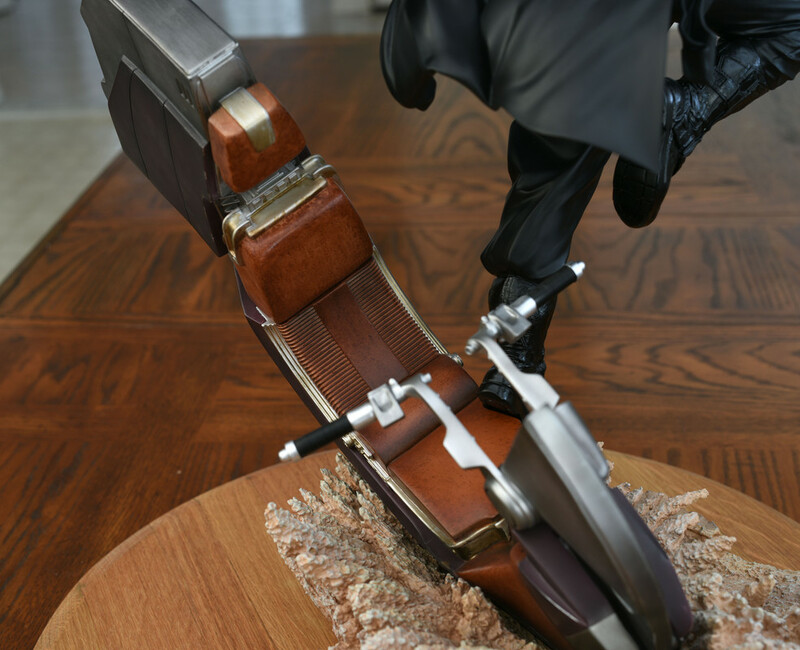 Rassam's attention to detail on Darth Maul’s 18 inch long Bloodfin speeder bike is outstanding. The Bloodfin, aplty named after a fierce aquatic hunter Darth Maul once battled on an ocean world in the Outer Rim territories, is a repulsor-lift vehicle with a powerful rear thrust engine. Its systems and schematics were designed to provide the rider with fast acceleration and easy maneuverability. Its small size also made it near impossible to target with a blaster, making the rider a formidable adversary. 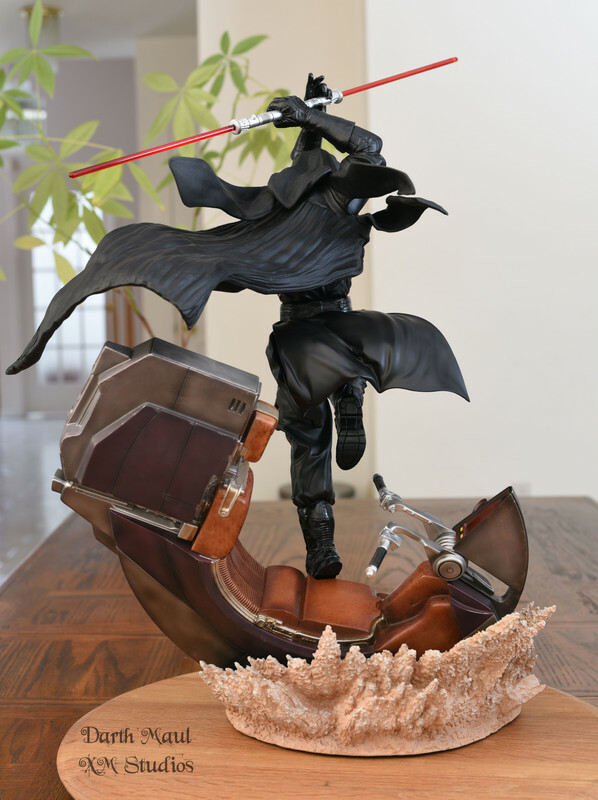 The curved seating on the Bloodfin allows Darth Maul to spring forth from the vehicle, immediately combat-ready, to take on his enemies by surprise. Rassam did an exceptional job on the Bloodfin. It literally looks like it just leaped off the silver screen on to my display shelf. The Bloodfin is positioned in such a way to make it look like it crash-landed into the splashed sandbank base with the engine still running. 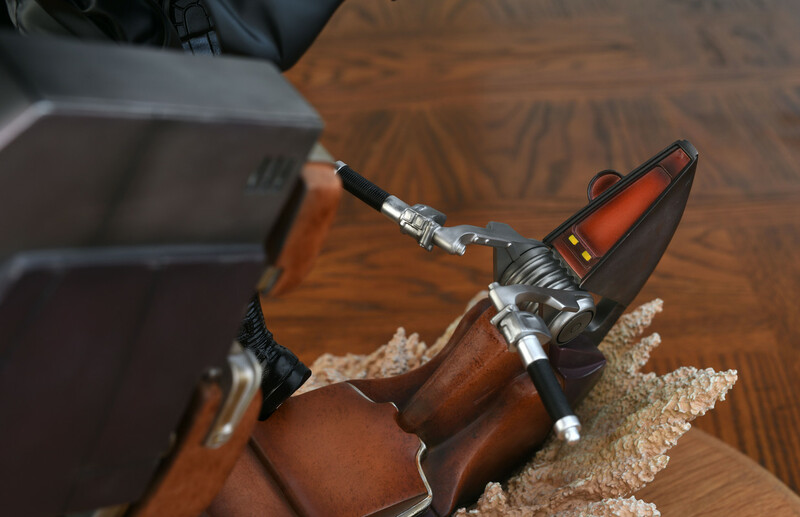 The battle-damage and wear on the speeder bike personifies warfare and combat. This is an excellent addition to this statue as it presents as half the story being told. 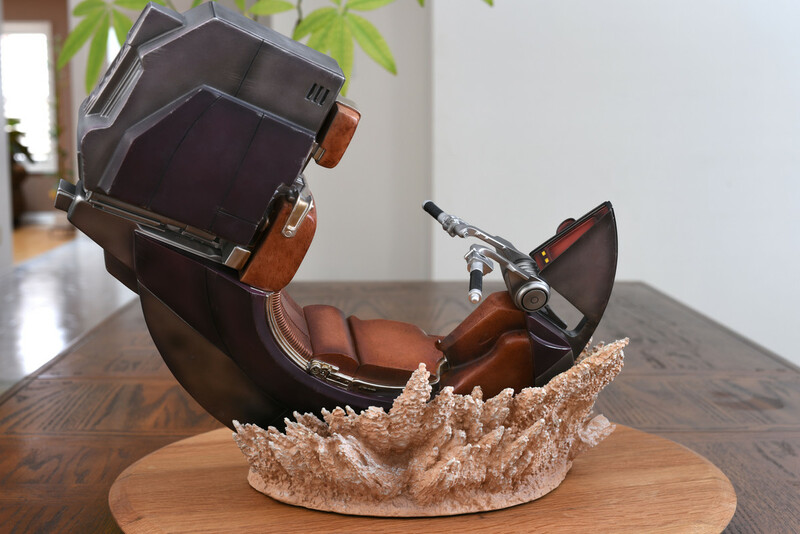 The pristine seating on the speeder bike actually looks like real leather too. 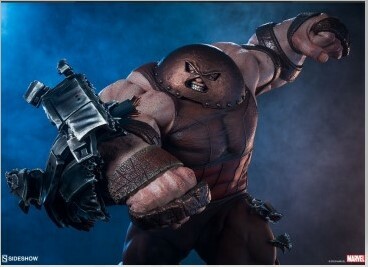 Hopefully, we'll be seeing more examples of Rassam's work in the near future. It's extraordinary. 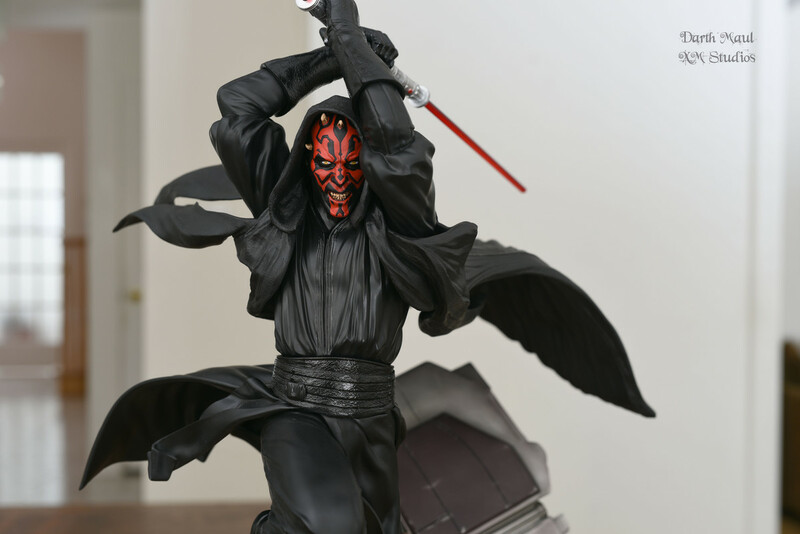 As a quick aside -- Star Wars fans often ask whether Darth Maul is red-skinned or black-skinned. Legendary Lucasfilm designer Iain McCaig, the artist largely credited with having designed the look of the dreaded Sith Lord noted that Darth Maul is actually red-skinned and that all of those black markings on his face were tribal warrior tattoos from his home planet. McCaig’s also indicated that when he was asked by George Lucas to design the Sith Lord, his objective was always to design something horrific, something that would terrify, and something that would withstand the test of time. 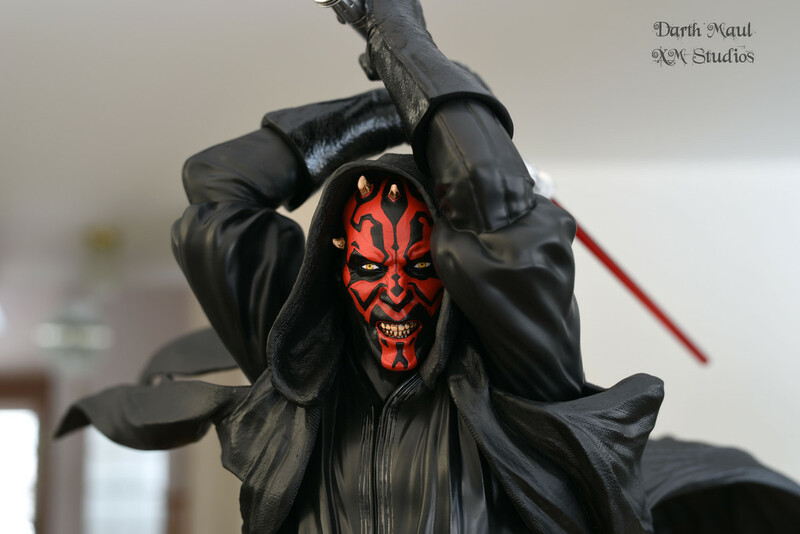 McCaig explained that he wanted Darth Maul to look flayed, as if his flesh had been stripped off his face leaving nothing but skinless exposed muscle. Ultimately, he created a repugnant being who lost all semblance of his humanity, unapologetically, leaving only hate and bile behind, whose sole purpose for living was to serve his evil Master and to eradicate the Jedi from the galaxy. Worth mentioning, this statue only comes in one display pose. There are no switch-out parts or different portrait options. At first, this struck me as odd as XM is known for having a multitude of display options. Thankfully, this one display choice is amazing enough to stand on its own. Truth be told, I’ve generally been the type of collector who typically chose one display option and stuck with it. I actually felt a sigh of relief not having to choose between change-o-weapons and unmasked portraits this time around. 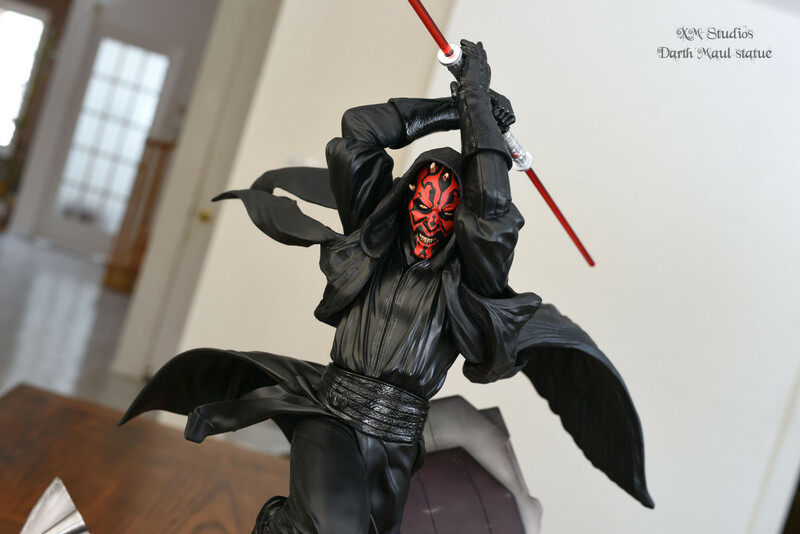 This clearly was a labor of love for the artist and designers involved in this project as they somehow managed to present Darth Maul in a manner we have yet to see in statue form from anyone else in the industry. This is excellent work. 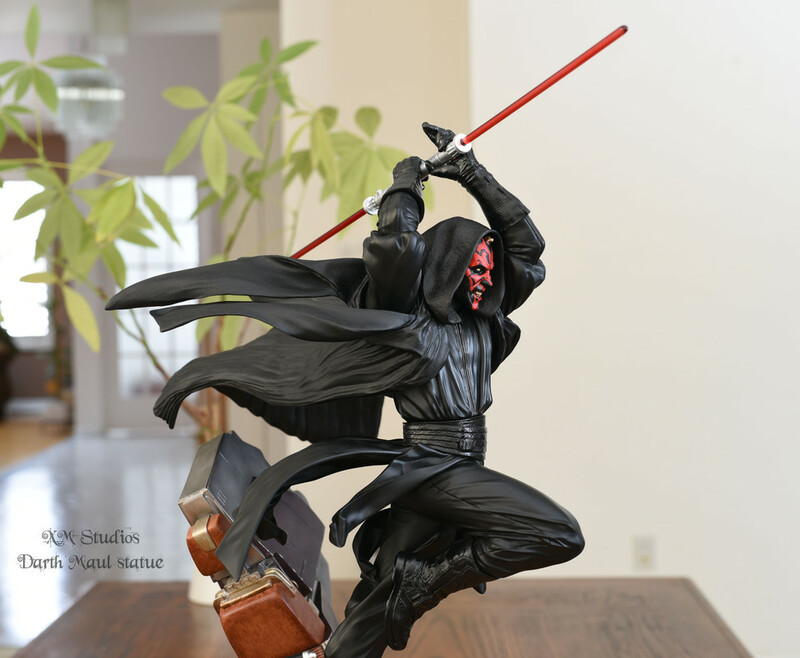 This could very well be the best Darth Maul statue ever produced. Paint/Mixed media: The blatant colors generally exuding desolation and despair appear to be the major color schemes used in this cold cast porcelain sculpture. We see pitch black, splashing golden-beige sand, battle-worn metal, and ruby red. The mix of shading is terrific in that it vividly shows the age and battle-damage of the Bloodfin, the hopelessness of the battle scene, and the fierce facial expression of the Dark Lord of Sith. The double-bladed lightsaber is made of ABS (i.e., a thermoplastic polymer). It’s a tough, impact and largely temperature resistant material. The Sith robe extensions appears to be made of a similar material (i.e., not porcelain). The paint applications on the portrait are outstanding. The black tribal warrior tattoos, finely discolored horns, decaying teeth, and the mesmerizing yellow-hued eyes all look ideal. The glossy tint used on his sash, boots, and gloves also present as a wonderful balance to the design. This was a wonderfully well painted piece. There was no painting over lines, smudges, or off-centered eyes, which is always a huge plus. From my vantage point, XM presented a near flawless application of paints, especially on his facial features, arguably the most challenging and daunting task of this design. Production and Build quality: When it comes to XM Studios, you can pretty much guarantee that you will be receiving a solid piece of craftsmanship. This statue has a fabulous size and shape to it. The magnets and pegs worked really well. There’s no tilting or imbalance to the statue or cause to be concerned about long term leaning issues. The seams are well concealed too. However, at 30 pounds, it may make this piece a challenge for some collectors to move around. Ideally, for me anyway, I generally prefer my statues to be in the 20 pound range, if only so I do not have to disassemble them whenever I want to move pieces around the display shelf. 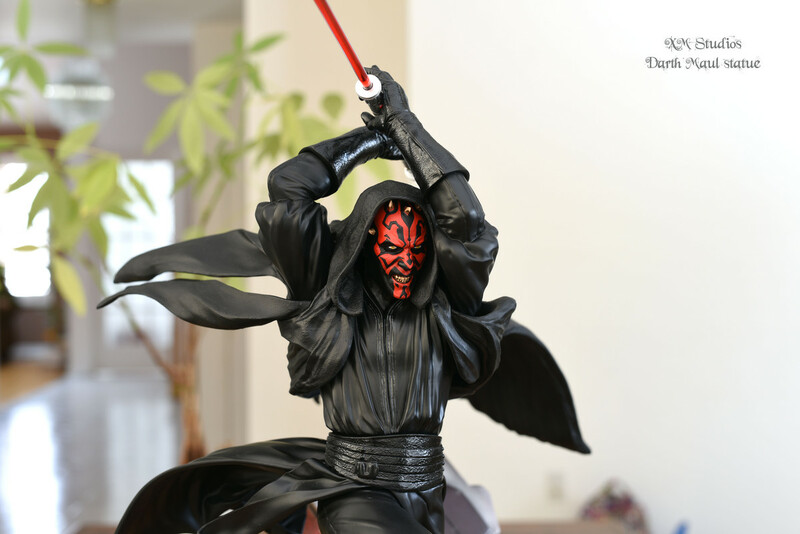 Truth be told, my Darth Maul actually shipped partially damaged. 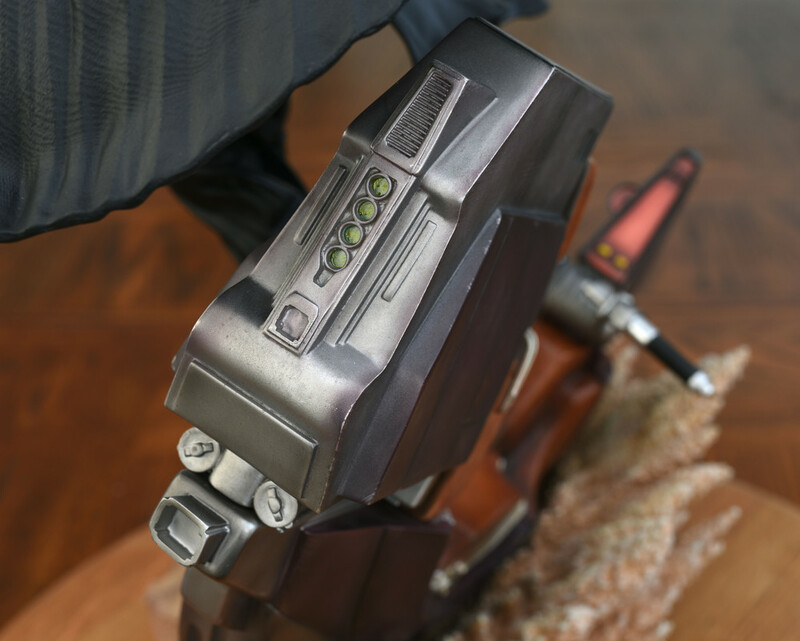 The 7 inch long Sith robe extension located right behind the lower body piece (i.e., right behind the sash) had snapped right at the edge. That area is really thin and looked prone to breakage during transport. At first, I had thought it may have been an engineering design flaw but I’m told that likely isn’t the case. Thankfully, the replacement I received arrived completely intact. The statue comes with a relatively easy to follow assembly booklet which identifies what goes where, when, and how. Extremely helpful. Design: This design epitomizes the rage that burns within Darth Maul. He presents as fearless, audacious, shamelessly reckless, and wholly identified by Sith vengeance. He appears to thrive on the terror he exacts upon his enemies just prior to them breathing their last breath at his unforgiving hands. This design personifies the character’s ruthless and unwavering objective to ultimately eradicate the Jedi Knights from existence so that the Sith Order may once again rule the galaxy without opposition. 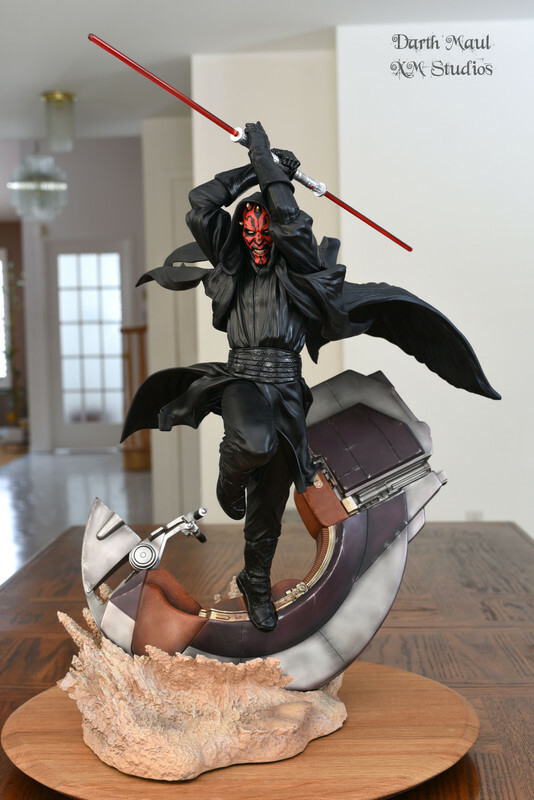 David Giraud and the XM Studios design and development team offer the fanbase a fabulous action themed interpretation of Darth Maul which features virtually every signature design typically associated with the character, most notably his Bloodfin speeder bike and double-bladed lightsaber. The slight I can point out on this piece is that the lightsaber could have been thinner and could have been more rounded or flattened at the tips instead of pointy. However, given the dynamic and fast-paced movement of this stellar design, it strikes me as a relatively easy issue to live with. 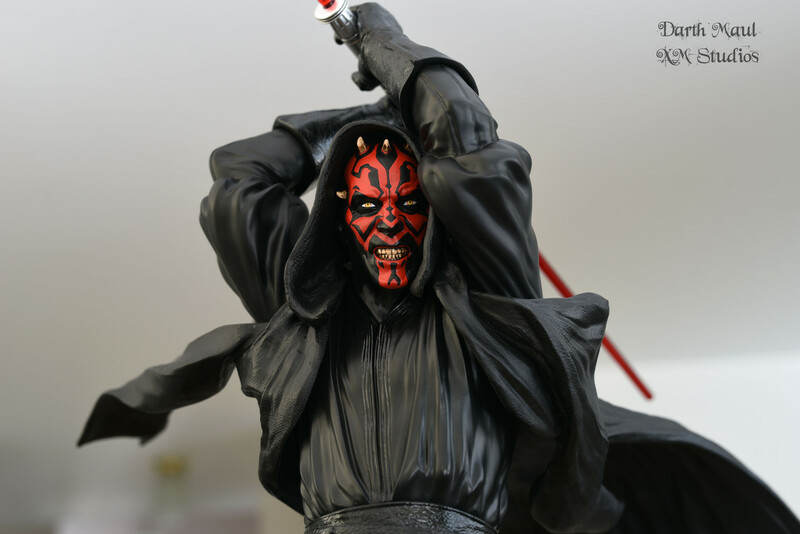 Perhaps the one other slight I might add is that we cannot really appreciate Darth Maul’s face from his left side as much as we could as his arm covers parts of it. Then again, the argument could be made that this particular positioning solidifies the maniacal intentions. 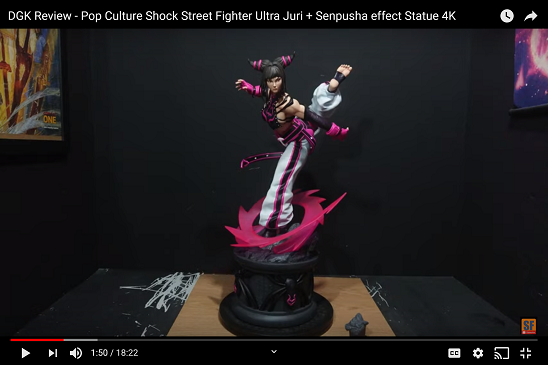 I was fortunate enough to have seen this incredible statue in person at the STGCC in September 2017, and it looks even more impressive in-hand than it did then. Again, I commend XM Studios for consistently presenting the fanbase with original designs which successfully blend the visual eye-candy with a captivating story which typify the character’s distinct personality and background. This is a spectacular piece and very much worth acquiring. However, given the very small edition size, it may not be available for long. Very highly recommended. P.S. Lastly, please do not forget to register your statue’s serial number on the XM website. Join the fight against recasters who continue to plague our industry in growing numbers. Thanks for the great review and the awesome pictures... you have really done a great job!